Moigniez was best known for his birds but he was also a very competent sculptor of other animals. His pair of Race Horses Little Agnes and Destinee are as finely modeled as any of Isidore Bonheur's famous Race Horses. It is unusual for Moigniez to sculpt jungle animals but his talent is obvious in this fine model of Two Lions. 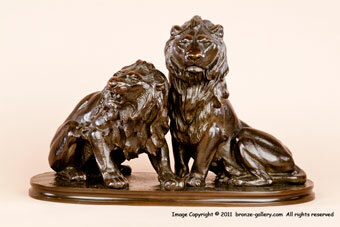 The Lion is considered the King of beasts and this rare model shows two male Lions sitting together. 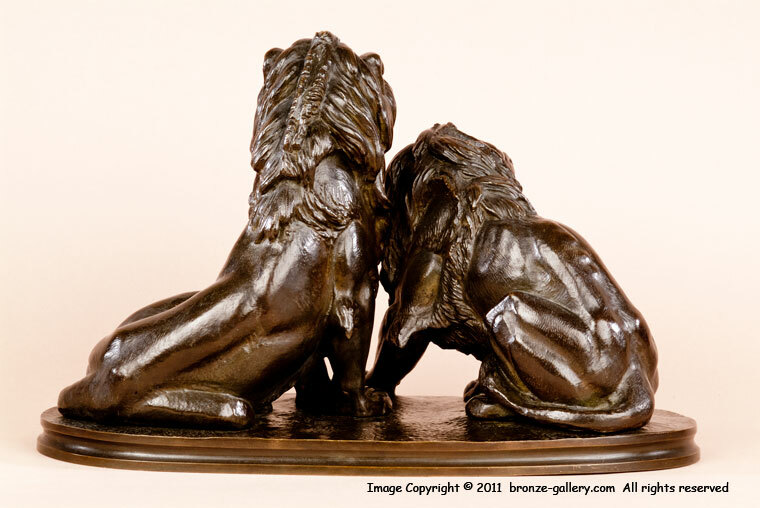 The detail and shaggy manes are expertly shown and one Lion is sitting proudly with his head raised while the other Lion is crouched down snarling. The bronze has a rich dark patina and is signed in script on the base. It was cast in Moigniez's own foundry and shows excellent details in the cast. A rare model that would please any collector.